although i bought it right away, i didn’t start playing through new super mario bros. wii immediately. i think part of it was just general sequel fatigue, but i was also wary of the game being too similar to its DS predecessor, esp. since my main playthrough of NSMB wii would be solo and not taking advantage of the game’s biggest distinction as being the first multi-player mario game. i had enjoyed the DS game but my main complaint at that time was the lack of novelty and the lack of a challenge. i was heartened to hear that this iteration would be much more challenging, and in fact i don’t disagree with nintendo power’s assessment that it’s “one of the hardest games in the [2D] series”. oddly enough, though, this proves to be somewhat of a drawback in that the challenge seriously detracts from the multi-player aspect. one of nintendo’s continuing goals has been to create an experience that can be shared regardless of players’ varying levels of ability, but i’m not entirely sure that they’ve succeeded here. a group of novices could barrel through a fair number of stages, relying on the fact that if at least one of them is alive at any point they can still proceed, but the difficulty ramps up so quickly that i think they would soon get frustrated. likewise, as i found out from personal experience, a mixed group would find the novices relying too much on being carried past the hard sections and not actually getting to play themselves as much. i think if newbies were willing to put in the time to improve their skills then i don’t doubt that they could get a lot out of the game, but as a pick-up-and-play experience the difficulty level of the original DS game seems to me like it would have been more appropriate. maybe i’m underestimating the tenacity and abilities of newbies, though. also, i have to remind myself that a casual group isn’t much concerned about beating the main game anyway; they’re probably just as happy to be playing the coin-battle or free-for-all modes and seeing who wins the most rounds. anyway, as for the other combination, a group of experts, i also played the game a bit with a mario vet and it was definitely fun. a nice mix of chaos, trash-talking, magnanimousness, cooperation, and revenge. not being a huge fan of multi-player in general i still much preferred playing it on my own, and although i beat the game fairly easily, playing through every level and collecting all the star coins definitely made the game much more interesting and fun. but as for originality . . . although i enjoyed the game and i am fully appreciative of the addition of multi-player, and although i know it’s churlish of me to feel this way since any mario platformer still towers far above the competition, i just couldn’t help feeling that the game, like many of nintendo’s franchises of late, clings too closely to its predecessors. 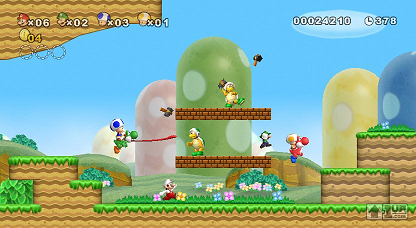 the DS NSMB mixed super mario world with the original NES game, whereas this one cribs more from the DS game and the sublime super mario bros. 3, and so those elements will feel new to those not intimately familiar with those games. but for a long-time mario fan such as myself, although it’s great to have cameos from SMB3 like the koopalings and the airships (kuribo’s shoe would have been even better), there wasn’t enough that felt really new to counterbalance the old. the ratio of new vs old has been widely contested, but that’s my take after having beaten the entire game. the two brand-new suits are great (although one could argue that both are largely based on functionality from previous games), as is the new ice flower power-up, and there’s a lot of great level design that at times can be very daunting, especially on the first attempt, but are rarely cheap. but i just kept waiting for real, smile-inducing surprises. several of the hidden levels did give me that unique mario euphoria (particularly levels 7-6 and 8-7), but those feelings were few and far between. another thing that ended up bothering me a lot is that as the game draws from such a long and storied past, the designers could freely pick and choose from among the most eye-catching elements of the previous games. as a result NSMB wii is loaded and feels like a huge mix (or remix) of content. the plus is that there’s a great feeling of variety (albeit overly familiar to long-time fans), but the drawback is that one is left with a distinct feeling of ADD. this being the MTV generation and all perhaps many would find this a definite advantage, but i found myself wishing for a bit more stability. in more concrete terms, for example, the fact that there are so few yoshi stages makes me wonder if, much as i love yoshi, it wouldn’t have been better to just not include him/it at all and focus that development on other areas. likewise, there’s only one stage that uses the “switch palace” map mechanic from SMW (that adds ! blocks to all the stages in the world), and there are so few mini-mushroom stages that the power-up itself just gets lost among the bustling crowd of the game’s other features (although there seems to be evidence of the remnants of more mini-mushroom usage in some of the stages, making me wonder if it originally had a more prominent role). and instead of having a few ghost houses and a few air ships, why not just focus on one or the other? in their attempt to cram in the “best of the best” nintendo has in some ways chained themselves to the baggage of the past instead of looking to the future by adding new surprises. among its other innovations, the game introduces the “super guide”, and i think to everyone’s relief the inclusion of an ability to skip past difficult levels hasn’t detracted from the fun or the bragging rights for anyone. the “hint movies” have also proven to be a great new addition. the “super skills” videos have smartly incorporated enough variety to make them entertaining (including some multi-player videos that are as tightly choreographed as a ballet), and the ability to see that a level is marked as having a secret exit without actually watching the video itself has proven to be a useful addition (although, as with previous mario games, most of these can be inferred from the maps). all in all i still can’t help feeling conflicted: although the game is a lot of fun and a much more satisfying level of challenge than ever before and although it offers up a new brand-new experience in terms of the multiplayer, at its core there just wasn’t enough of the “it” factor to make me rank this among my list of all-time greats. i suppose time will tell if my opinion will change. in any case, playing this game has made me want to replay the DS game, and i’m still hopeful that in its next iteration the series will deliver the level of innovation that earlier games in the series had. new mario (and luigi and toads) links! – iwata asks feature: these interviews with miyamoto are like master classes with a virtuoso. miyamoto is amazing.